For the second straight week the Maryland Terps have played as hard as they possibly have could have, but at the end it was another week on the short end of the win column, but this game was really different than anyone this season and one they should have won. The difference? One call for two points to win the game in overtime. All of those shoulda coulda and woulda, don’t really matter for a team that has just one more game remaining to become bowl eligible in Penn State on the road next week. 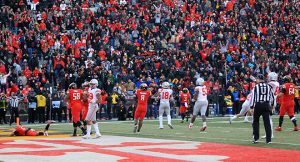 After the teams traded touchdowns in overtime — a 5-yard run by Ohio State quarterback Dwayne Haskins Jr. that gave the Buckeyes their only lead of the game and a 1-yard run by Maryland sophomore running back Tayon Fleet-Davis — it came down to Canada’s decision to win in the first overtime than go to a second. Ohio State (10-1, 7-1) celebrated its come-from-behind 52-51 victory before many of its fans in the announced crowd of 38,177 at Maryland Stadium that kept its hopes alive for a Big Ten East title going into next Saturday’s game in Columbus against No. 3 Michigan. With the way the season has gone for the Terps can anyone fault Canada for trying to make this the biggest upset we have seen in College Park in years? If it would have worked, he would have been the hero, instead it looks like this call was in hopes of avoiding a tie again if they would have traded touchdowns again in another overtime shootout. Ohio State Dwayne Haskins Jr. led the way for Ohio State along with J.K Dobbins spearheaded the run in the fourth quarter and in the overtime both were integral parts in making sure they were the ones doing the celebration at the end. Haskins completed 28 of 38 passes for 405 yards and three touchdowns, which eclipses Ohio State’s single-season passing yardage mark and ties for the most touchdown passes in a season. D.J Durkin Removed For Coaching Duties, What’s Really Wrong With Maryland Football?? ?